The mayhem by the Fulani herdsmen across the geopolitical zones in Nigeria has continued to dominate the media space with columnists using their pens freely. The news headlines are literally dripping with blood! Let us list a few of them: “Armed Fulani herdsmen kill 50 in Benue”. “Another 55 people killed by Fulani herdsmen in Taraba State.” “Killings by herdsmen: Soyinka lambasts FG.” “My people have been abandoned by the FG”-Gov. Ortom of Benue State.” “Fayose holds security summit with hunters over killer herdsmen, calls for them to be labelled as terrorists”. But the one that got me intrigued was the claim by the Presidency that Nigerians have not raised much concern by way of publicity on the mindless menace. As a response I hereby reproduce my essay first published on March 27, 2016. This is to show why government at all levels must take public affairs analysts more seriously, even as they are enjoined to live up to their responsibilities to the people. The scarce regard for the sanctity of human life, as callously exhibited by the spate of senseless killings of defenceless Agatu people by rampaging, fully armed, Fulani herdsmen in Benue State diminishes us as a nation, as a people. Yet, it did not all start today. 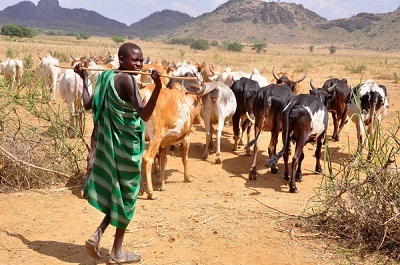 From Plateau through Taraba to Benue, the blood-thirsty marauders masquerading as pastoralists, but driven more by an expansionist agenda have wasted thousands of innocent lives. With impunity as their wielding stick, they still walk our streets as free men because here, we are not equal before the laws of the land. That is just part of the pain. The other is the obvious utter negligence of duty, or at best the lukewarm attitude of security personnel to the wanton wasting of the priceless lives of fellow citizens. Policing should ordinarily embrace the culture of sensitive information gathering, identifying potentially volatile areas of conflict and deploying well-trained personnel there to forestall such issues from exploding to unmanageable conflagration. Taking proactive measures would have saved thousands of lives. Prevention, as the wise ones say, is not only cheaper but wiser than cure. But as we have witnessed in the horrendous macabre dance of death by the politically-motivated killings before, during and after elections, our security men have been left wondering what really went wrong. It is, therefore, hardly surprising that conflicting figures of casualties are given, after the deadly deeds are done. For instance, while one Paul Ede, the coordinator of a civil society group, put the number of Agatu people sent to their early graves by the Fulani militia men at 400, the Commissioner of Police, Benue State Command, Paul Yakadi, claimed that “only three corpses were seen in Aila and Adagbo”. It was a similar account of shadowy figures paraded in 2015 after Egba, another Agatu village was brought to ruins by some Fulani herdsmen when media reports put the figures of the victims at 90 but the then police commissioner of Benue State, Hyacinth Dagala, claimed only 30 corpses were recovered. It was, however, good enough that the police chief painted the larger picture in a more credible perspective for the recent killings. He explained how the invaders moved en mass from Loco and Doma in the neighbouring Nasarawa State and brazenly sacked seven villages in Benue State. In the mindless mayhem that followed, many Agatu villages were razed to rubbles, some 7,000 occupants thrown into disarray after which their places of origin were taken over by the army of Fulani herdsmen and some 5,000 cattle. The excuse given in some quarters that the recent attacks came as reprisal for the killing of a Fulani chieftain by some Agatu militia men further exposes the obvious lack of prompt response to potentially combustible situations. That tragic event was said to have taken place back in 2013. So far, the two wrongs committed have not added up to a right. The current horrifying spectacle reminds one of how in December 2011, some armed Fulani men invaded a village somewhere on the Plateau at the dead of night, burnt their huts to ashes and used nets to “capture” those running for their dear lives, only to be hideously hacked to death with daggers, axes and cutlasses, as if they were some sacrificial fowls. It was a similar gory tragedy back in 2013 when 74 mobile policemen and four DSS operatives were assaulted and their lives brutally wasted by the Ombatse cult group in Nasarawa. Did these gory tales take place in the 21st Century Nigeria, one may be compelled to ask? Yes, of course. Worse still, no one was brought to book, to pay for the priceless lives lost. That again, shows us just how equal we really are before the law. This saddening, sorry situation throws up mind-riveting questions. What would have happened for instance, if it was the Agatu people that had gone up North to kill Fulani herdsmen, for some spurious reasons? Who has been arming the herdsmen with sophisticated weapons, including AK 47 rifles? Why have both the former Benue State governor, Gabriel Suswam, and his successor, Samuel Ortom, found it one Herculean task to curb the menace of blood-seeking Fulani herdsmen? Why couldn’t they borrow a fresh leaf from the erstwhile governor of Jigawa State, Sule Lamido, whose administration established grazing fields for the cattle rearers beyond which they could not graze? Why haven’t the police nabbed even one person and bring him to trial over these atrocities? What lessons are our political helmsmen passing on to the current and future generations if they have grossly failed to abide by the dictates of Section14 Sub Section 2(b) of the 1999 Constitution, (as Amended) which expressly states that the primary purpose of government is to guarantee the security of the lives and property of the citizenry as well as provide their welfare? The answers to these burning questions would go a long way in restoring the confidence of the citizens in government, as a protective and providing father figure. Our legislators should come up with laws to guide the activities of nomadic Fulani herdsmen and offenders made to face the full wrath of the law. Equally important, is for both the state and federal governments to find a lasting solution to the recurring ugly decimal of innocent, harmless Nigerians finding themselves defenceless before fellow armed citizens of whatever professional or religious disposition. Many a farmer, as it happened to Chief Olu Falae, have found themselves haunted by the spectre of armed pastoralists laying claim to lands they do not own. They behave as if their cows were more important than the cash crops they trample on, or turn to foodstuff, or the irreplaceable lives of the owners they waste. Indeed, the frequency and gravity of the killing spree by Fulani herdsmen should inform us that we are greatly under-policed. It also shows that the current centralised policing system, just like that of our political power structure are antithetical to the dictates of an enduring democratic culture. We need more of community policing, in a similar way that we deserve a diffusion of power from the bloated federal centre. Both breed bad blood. Impunity must be done away with. A Truth and Reconciliation Committee should be set up by the state government to get to the root of these recurring and worrisome inter-ethnic clashes and bring them to an end. Above all, Nigerians must be treated as equals before the law.